If you ask any person working in an office what they look for in the perfect chair, the answers would basically boil down to two factors – status and comfort. The Embody chair fulfils these criteria effortlessly and the product has become synonymous with its innovative use of style and functionality. The makers of this chair have made it a point to ensure that the Embody justifies its hefty price tag by packing the chair to the brim with several amazing features. 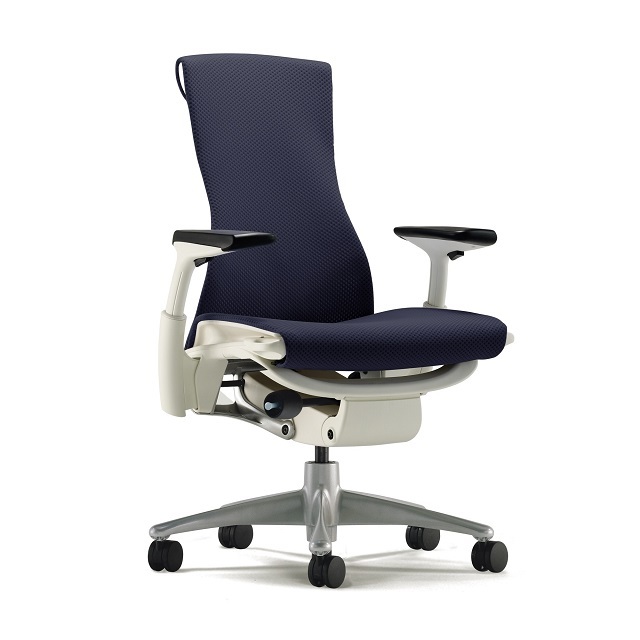 So, it’s no wonder that the Embody feels like the office chair you always wanted but never needed…until now. The entire body of the Embody chair is composed of fully sustainable and non-toxic materials with a staggering recycled content index of 42%. This means that the chair, which is beautiful to behold, is 95% recyclable and every single groove, joint, connector and edge of the product is a work of art in itself. Seven separate types of levers, knobs and buttons allows the chair to be adjusted in such a way that it conforms to the unique shape of your body. The seat itself is comprised of four individual layers, with the bottom containing a range of plastic bands for suspension. The second layer boasts of supportive coil sheets while the third contains a network of hexagonal rings whose purpose is to shift the weight of your body with every movement. The main reason why the fourth and final layer exists is to make sure that the sitter feels cool, thanks to the inclusion of mesh that facilitates air circulation. The backrest of the chair is, without a doubt, the most essential part of the Embody chair. According to the manufacturer, this portion is comprised of a whole system of pixels that form a unique seat-and-back surface capable of adjusting automatically to each of your movements and can effortlessly distribute the weight of your body in an even manner. The outcome of this is that you will feel a lot more relieved from the effects of stress, your posture will become more enhanced, your heart rate will be lowered, circulation will improve and overall, you will become a more productive and happy worker. Aside from the obvious health benefits of the Embody chair, one area it greatly succeeds is comfort and you can be rest assured that for the amount you are spending on this product, you have never experienced this level of comfort before. Your entire body will start feeling at ease and you have the freedom to adjust the degree of recline along with the depth of your seat, the tension of recline, the positioning of your armrests, the curvature of your back and the height of your seat without any kind of hassle. You might be thinking that all this is possible on other chairs and so, what exactly makes this product so special. Well, the answer is the individual supports present in the backrest of the chair that lend additional comfort. The individual coils are extremely helpful for supporting and adjusting the various contortions your spine is going through on a daily basis. This is an extremely sturdy chair and is very heavy. The durability factor is one of the reasons that makes the Embody chair such a worthwhile investment. This chair is not going to sustain any sort of damage no matter how much wear and tear it undergoes. You can push the chair back and lean on it as much as you want without the risk of breaking the product. Many office-goers experience a distracting falling sensation when they sit on a soft chair and the Embody chair has safeguards in place to prevent such a situation. All you need to do is crank up the tension to a sufficiently high level and you will no longer have to worry about any discomfort when you recline your chair too quick. The Embody chair has a lot of value for sitters at work due to its fine blend of comfort and functionality and if you can justify the high cost, then you should definitely go for it without any second thoughts.